Visit the Victorian elegance and charm of a wealthy bankers mansion. One of Minnesota's oldest operating Bed and Breakfast. 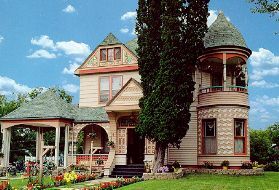 This gingerbread style home was built in 1889 by Michael Scanlan (known as the founder of Lanesboro) and is Lanesboro's oldest operating Bed and Breakfast. We have rooms with fireplaces, whirlpool tubs for two, unique gifts and, of course, our famous 5-course breakfast (included in all rates). Historic Lanesboro has antique shops, live professional acting theatre, a 40-mile paved bike/rollerblade/hike trail (Root River State Trail), canoeing, tubing, tennis, Amish Tours, Amish cheese factory, winery, Minnesota's only two natural caves, 9-Hole public golf course (right outside our door), specialty shops and boasts 14 different restaurants in the immediate area from cafe to gourmet dining! We offer special rates on Bike, Canoe & Tube rentals! To make your weekend extra special we can have flowers, scrumptious seasonal fresh fruit, deli meat, and cheese (made locally from Amish products) platter or Gourmet hand dipped chocolate truffles placed in your room upon your arrival for a nominal fee. Family Owned and operated for over 13 years! November 16 to May 1, Thursday & Sunday changes to Weekday rates. This and other Lanesboro Bed and Breakfast Inns can be found here in The Register.